My photo does not do this bowl set justice. The gold accents make it look very festive against the black hand painted leaves. 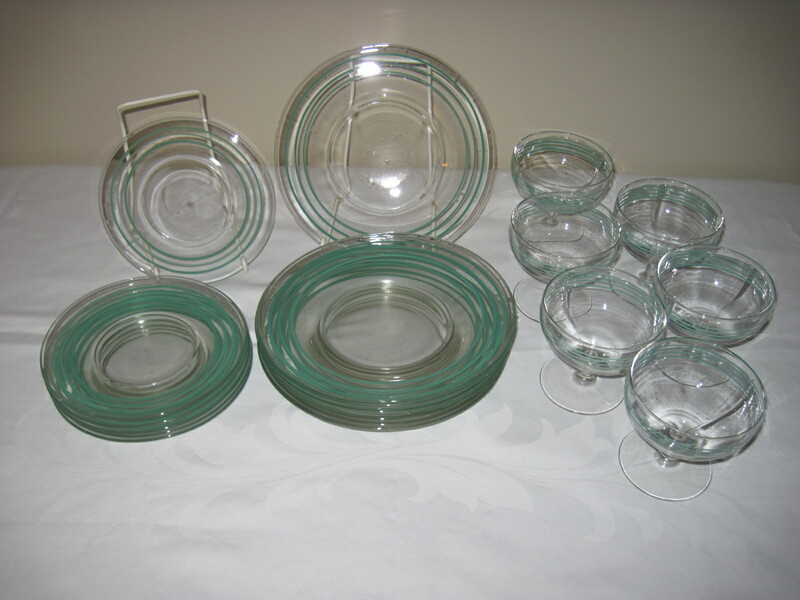 I believe these sets were made by Anchor Hocking although there are no markings on them. I have several mugs by Anchor Hocking with very similar patterns of leaves with the gold trim so I am deducing that they are from the same company. 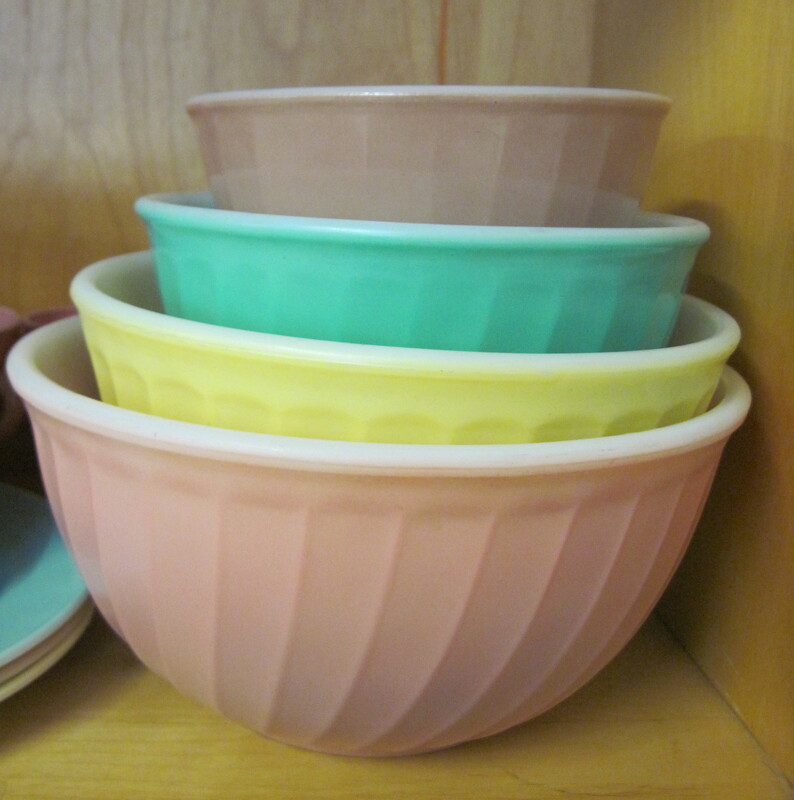 These bowls were produced in the 1950’s to 1960’s when chip and dip sets were so very popular. These sets came with leaves painted in turquoise, brown, yellow and probably other colours as well. This is first black set I have come across. Potato chips were first invented in the 1850’s but the chip and dip sets weren’t on the market until the 1950’s when buffet style of serving food became “the” word in entertaining at home. Priced at $ 25.00 for the set. 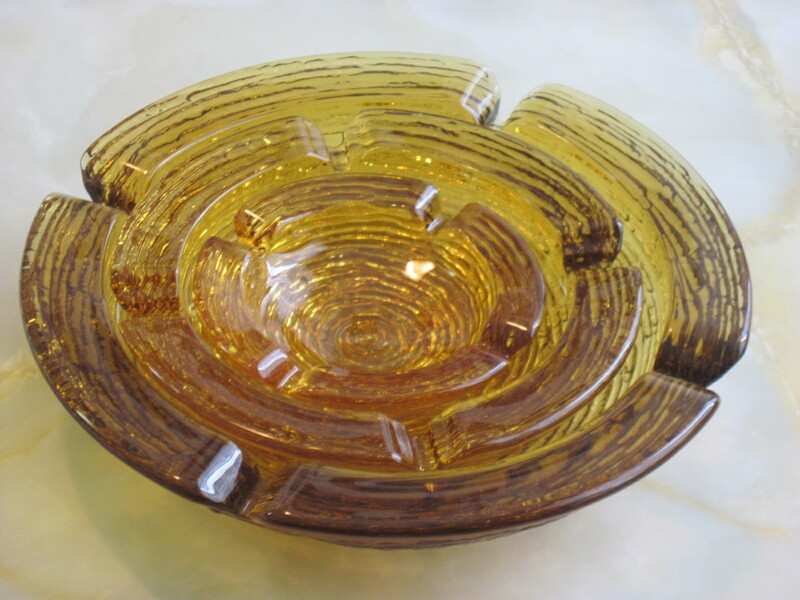 Nesting ashtrays, made by Anchor Hocking in the 1960’s. Pattern is called Soreno. The company made them in avocado green, teal blue, pink, crystal and irridescent and this colour which is called ‘Honey Gold’. I think everyone had an ashtray like this in their homes in that era. They were plentiful to find a few years ago but not so much now. If you would like to see this item and other vintage dishes from the mid 20th century, please visit my booth Fab Finds at the Almonte Antique Market, 26 Mill Street, Almonte ON. Just 30 minutes west of the city of Ottawa ON. Open 7 days a week, all year long, from 10am to 5pm. Over 50 vendors housed in a beautiful 2 storey heritage building. 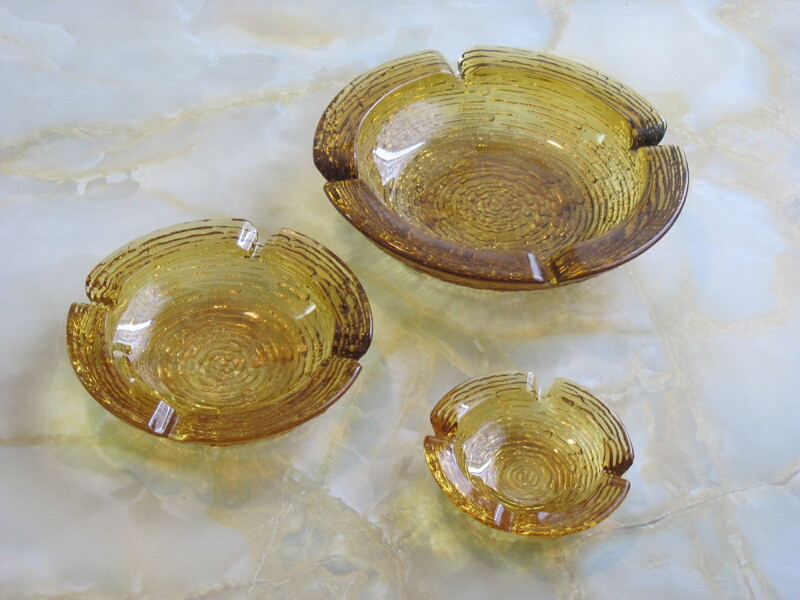 This nesting ashtrays are priced at $ 30 for the set. 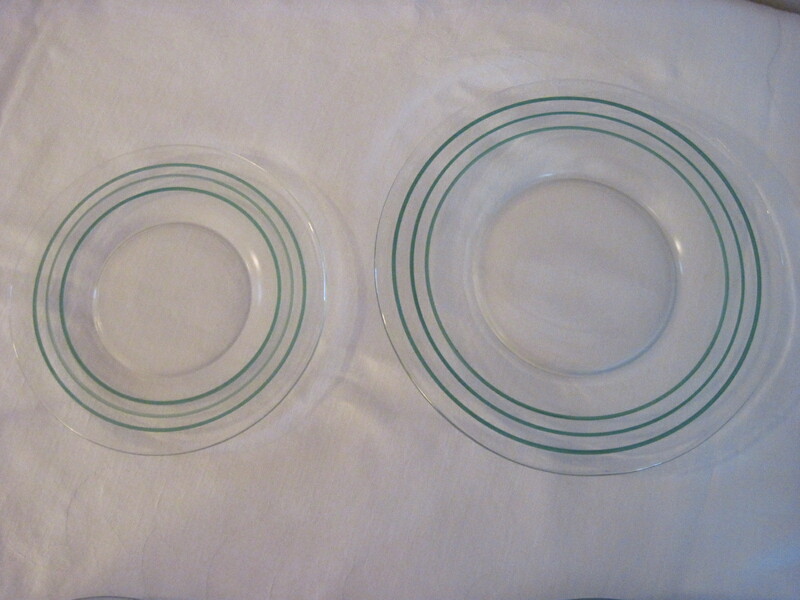 I don’t know the name or manufacturer of these clear glass dishes. I am thinking they may be by Hocking or Anchor Hocking and date to the 30’s. They do look like Hocking’s Banded Ring a bit but there are no other designs on the glass other that the rings of colour. I am continuing my research and will update if I find out the proper name for them. If anyone can identify the pattern and maker, please drop me a line. There are 6 sherbets with underplates and 6 lunch sized plates. Regardless, they are quite lovely and dainty and will look nice on your table this coming spring. All are in excellent condition. For sale shortly at my booth at the Almonte Antique Market, 26 Mill Street, Almonte ON. 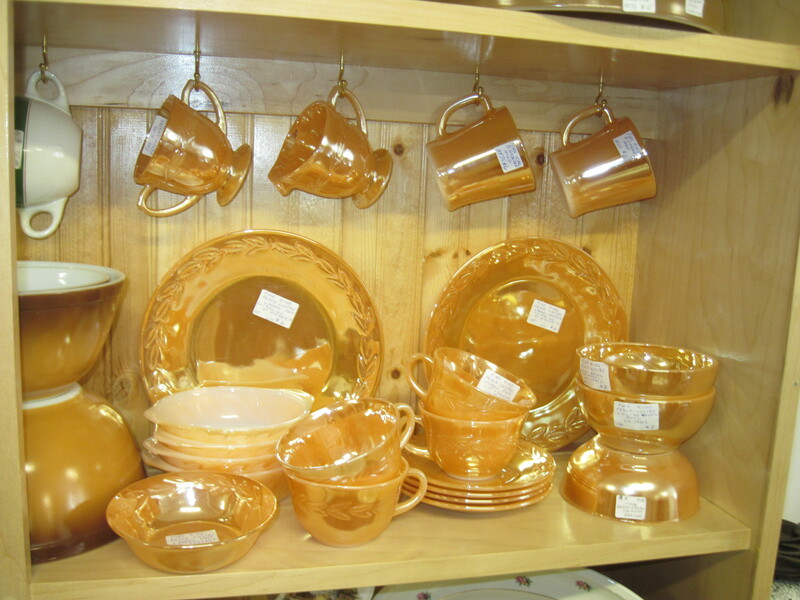 Fire King Peach Lustre dishes in the Laurel pattern and 3 band pattern. First made in 1951 and continued production until 1963. Hard to find in really nice condition as the finish tended to wear off after continued washing. These are all pristine. These should never be put in a dishwasher or scrubbed vigorously. The finish can last quite well with care. The dinner plates are all sold, but I still have in stock cups and saucers at $5 a set, chili bowls at $8 each, mugs at $6 each, cream and sugar are $5 each. Mini casseroles in the copper tint colour are $3 each. Small dessert bowls are $3 each. For sale at my booth at the Amonte Antiques Market, 26 Mill Street, Almonte ON, just 30 minutes west of the city of Ottawa. Ca. mid 50’s to early 70’s. 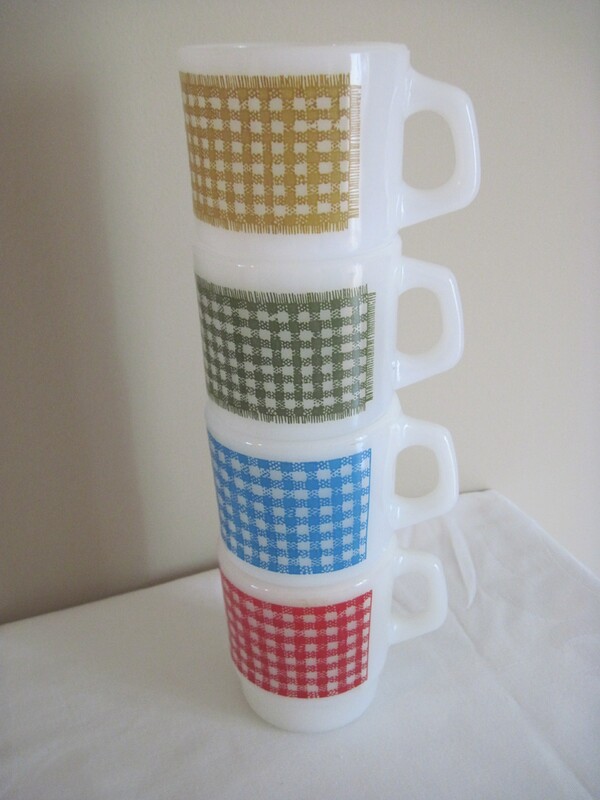 Anchor Hocking’s Fire King line of stackable mugs, with a pattern called Gingham. Nice clean graphics. The set is for sale at my booth at the Almonte Antique Market, 26 Mill St. Almonte ON. Price $ 25.00 for the set.